Business owners, investors, gamblers, and job employees -- everyone could use more money! 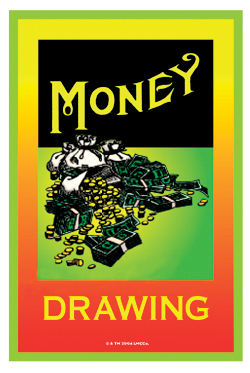 Read More on Lucky Mojo Money Drawing Merchendise. 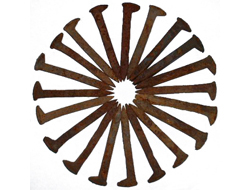 Avoid home foreclosure, or stay securely in your rental property with this free old time conjure spell employing railroad spikes. If you want or need personal help in performing magical spells, looking for a qualified rootworker, or interested in a reading, visit our Readers and Rootworker's Page. Get A Reading from Cat or Elvyra! Welcome to the Lucky Mojo Newsletter for February, 2009. We've sent you this email newsletter because you are a Lucky Mojo customer and we want to tell you all about our new Lucky Mojo Forums, the Jan 31st Radio Podcast on Monamagick.com with catherine yronwode, featured articles on the Lucky Mojo website, a free spell -- and offer you a very special coupon discount for shopping online. Get your Mojo Working with Lucky Mojo! On January 29, 2009 we released the Lucky Mojo Forums. Our thanks to Lara Rivera and Art Roberts for their help in getting this project up and online for the good of our conjure community! The Lucky Mojo Forums were created to provide answers to your questions about Lucky Mojo spiritual supplies and hoodoo rootwork. On the forums you can get your questions answered on how best to use Lucky Mojo anointing and dressing oils, incenses and resins, baths and washes, sachet powders, candles, herbs, roots, minerals, mojo hands, spell kits, honey jars, amulets, charms, altar tools, and learn more about the Hoodoo Rootwork Correspondence Course. Not only do we offer your questions answered by QUALIFIED PRACTITIONERS who are graduates of cat yronwode's Correspondence Course, we also invite you to introduce yourself to the community, ask for help with spellcasting, make contact with a professional Reader or Rootworker, share you own hoodoo spells, and tell everyone about the fascinating world of hoodoo in the news. We've had over 1,000 posts since we started, with an average of 15 posts per day. We have almost 200 members already! It's free, it's easy, and it's fun! Please Join Us! Do you know what Hoodoo is? Would you like to journey to the depths of African American folk-magic? This radio show will open your eyes and expand your mind to one of the most effective, and widely practices of magic known to many however needs to be clarified to most. Catherine Yronwode has been a professional writer and editor, as well as an astrologer and folk-magic practitioner for more than 40 years -- the Lucky Mojo site grew out of her work on several books on folk-magic and "just grew" into a commercial enterprise, unplanned. 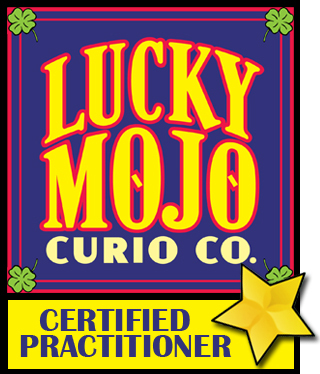 About Lucky Mojo Curio Co.
We at Lucky Mojo Curio Co. would like to take this opportunity to thank each of our customers for their patronage over the years. We are committed to providing you with the very best Hoodoo, Occult, Religious, and Spiritual Supplies possible. For a special thank you, please visit our NEW online store and receive a 5% discount on your next purchase -- see the money-saving details below!